Collon House is a perfect location from which to enjoy the wonderful treasures of the Boyne Valley. Bru na Boinne (Newgrange) prehistoric megalithic sites, The Battle of the Boyne visitors centre at Oldbridge, Slane Castle, Old Mellifont Abbey and Monasterboice High Crosses are all less than twenty minutes drive from Collon House. 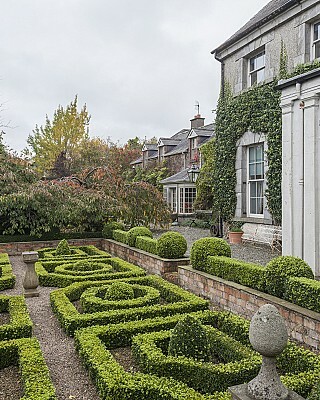 Built in 1740 in the Irish Long House style, Collon House was the home of Anthony Foster, Lord Chief Baron of the Exchequer. His famous son John “Speaker” Foster (born 1740), was the last Speaker of the Irish House of Commons up to its dissolution by the Act of Union in 1800. John Foster later became a peer of the United Kingdom as Baron Oriel of Ferrard in the County of Louth until his death in 1828. Dinner rate Dinner from €60. Not always available, booking essential. Calendar / Open Open all year, except Christmas. Group bookings & private parties by arrangement.